They were there! Shoved into a somewhat dirty corner, but still! No Buy July reeeeally taught me restraint, because out of over 40 new polishes in the megalast collection, I picked up just 3, count them... three polishes!!! 2% Milk (to cross off my wishlist), Sea Change, and Black Light Party. Here's the latter of those... Black Light Party in all its glory! If you're feeling a bit of deja vu looking at these swatches... Well, there's a reason. 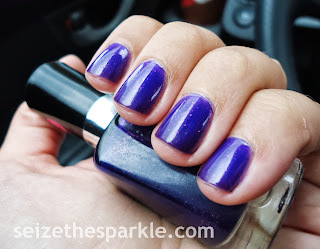 Remember that Sally Hansen color Purple Pizazz? I'm pretty sure that if this isn't a dead-on dupe, it's pretty close. These polishes from Wet n Wild feature the Manicurve Pro brush, and you know. I've said before that I don't like it. It's incredibly awkward to paint my nails with because it is sooooo wide. BUT. The curved part is actually growing on me. (I know!) It allows me to get decently close to the bottom edges of my nails without totally flooding my cuticles. That being said, I still think they could trim down the width of these brushes just a smidgey. Pretty Please? The formula is good too. It took 3 coats of Black Light Party to reach a nice streak-free jelly finish. 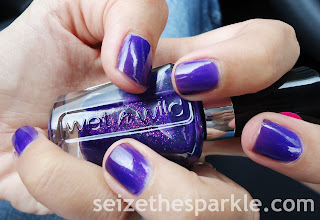 Have you picked up any of the new Wet n Wild megalast shades?